Explain chiller speaks to what is a chiller and how does a chiller work. Chiller information explains that the operation may be reciprocating or centrifugal and provides chilled water for air systems cooling coils. Centrifugal are used for large applications. Reciprocating are used for small applications. The equipment exists to provide a medium which will remove heat from the building air to maintain comfortable ambient conditions. System design is such that water is usually supplied at 42 F but should be matched with the design requirements of the air systems cooling coils. Prior to the cooling season a thorough inspection should be done before start up. The inspection must be done by service people who are totally familiar with how chilled water systems work. These technicians are qualified and have extensive training in start up procedures. Chiller operation is based upon the refrigerating cycle and understanding this cycle is necessary. In the refrigerating cycle, heat from air passing over the cooling coils raises the water temperature which is circulated through the evaporator. The heat of such passes through the chiller coils, raises the temperature of the liquid refrigerant to it's boiling point and evaporates it into a gas. Note: One ton of refrigeration is the rate of heat removal which will produce one ton of ice at 32F from water at 32F in 24 hours. To understand, it is necessary to know the three main equipment components. Removes heat from air passing over the air system cooling coils. The evaporator consists of a series of coils, in which the liquid is evaporated into a gas. This is occurs by absorbing the return chilled water heat at a low temperature after it's pressure has been reduced through the expansion valve. Maintains a lower pressure in the evaporator than in the condenser. The refrigerant liquid will expand and drop in pressure while passing through the small opening of the expansion valve. This raises the pressure of the evaporated liquid to a point where the condensing temperature is above the temperature of the cooling water available. Note: The refrigerant serves as a heat transferring medium with the heat finally disposed of by the condenser. It cools the hot gas received from the compressor to a point where it will condense into a liquid. 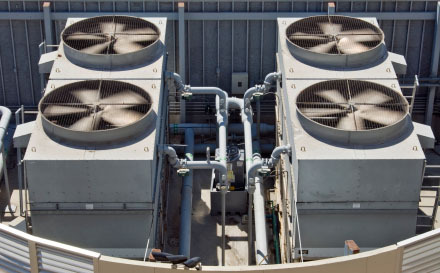 The condenser may be air cooled or water cooled. The air cooled condenser simply has air blown through rows of tubes containing the gas from the compressor.